Alphonso, the king of fruit, is one of the, most premium Varities of Mangoes grown in the Month of April and May at Konkan and Rattnagiri, regions of Maharashtra. This plump, juicy, sweet and sour fruit, beside its huge domestic demand is exported worldwide with huge demands from UAE, Europe and Asia. India not only grows Alphonso but more than 1000 varieties of Mango, making India the largest producer and exporter of Mangoes. The other famous Varities known worldwide are Totapuri, Raspuri, Dusherri and Kesar. Indian Mangoes account for 40 percent of the world output, as per data from UN foods. 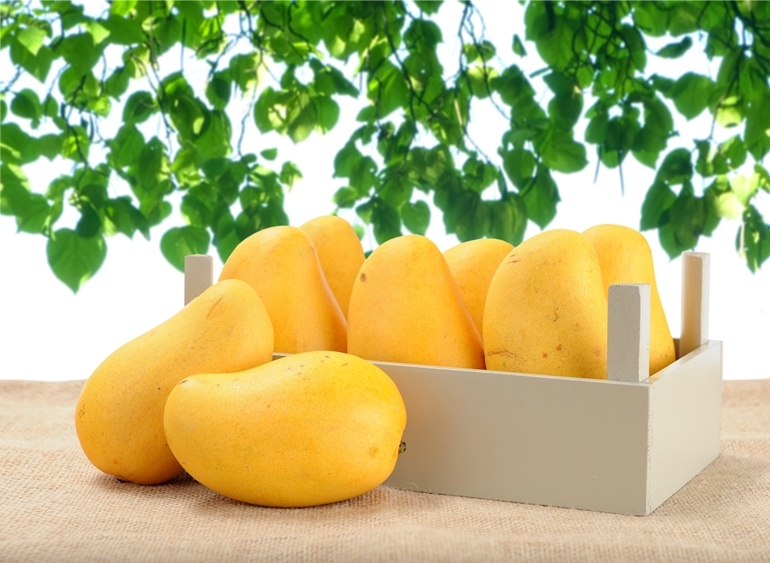 When it comes to export , Middle East is the main market for Indian mangoes, however India making efforts to increase its export share in the USA, Australia and Japan Markets, where the strict compliances makes it difficult to enter the market, Indian exporters also face tough competition from Pakistan, which has cheaper than the Indian mangoes. It’s not only Fresh mangoes, but the processed form of Mangoes is equally exported from India. Mango Pulp, prepared from selected, picked fresh mangoes which are transported to strategically located Mango processing plants. Selected high quality fruit is washed, peeled, blanched, deseeded and pulped. The ready pulp is hermetically sterilized and packed in the aseptic bags and tin cans. Frozen pulp is also an upcoming industrial product pasteurized and deep-frozen in plate freezers. The process ensures that the natural flavor and aroma of the fruit is retained in the final product. IQF – Individual quick frozen Mango Slices, Dices and Chunks are also have increasingly demand due to their readiness and easy to use properties. Mango Pulp/Concentrate is a perfect industrial suited product, used as ingredient for manufacturing juices, nectars, drinks, jams, fruit cheese, yoghurt, confectionery and various other kinds of beverages. With the new season 2013 arriving, companies are energetically promoting the mango internationally through festivals and campaigns. This is definitely a promising season, as the crop is expected to be good. Says Mr Sumant Bindal, Director- Shimla Hills- one of the leading manufacturer and exports of Mango pulp from India. India eyes huge export potential for its fresh new season, which has just started. There are expectations for a better mango season than those seen over the previous two or three years in India. An increase in the supply of mangoes is observed in the recent weeks compared with the same time last year. However, the availability of export-quality mango depends on weather condition which has been conducive this year as per the sources.